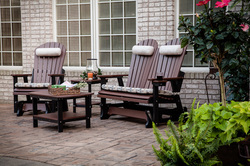 This Tete-a-Tete table that joins two dining, counter, bar, or Adirondack chairs. 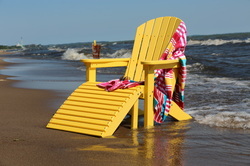 $167 for most chairs except the Adirondack has a custom Tete-a-Tete for $187. Choose a matching color or an accent color. 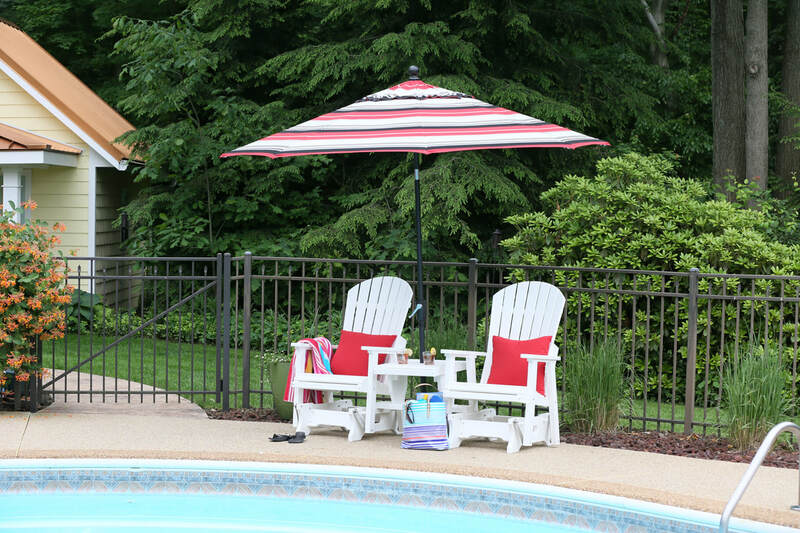 This is a great way to join two chairs so that you can take advantage of an umbrella! We sell 9' umbrellas in Sunbrella beautiful fabrics! Stationary footstool. Shown here in kiwi. Available in all color choices. $154 for smooth finish colors, $173 in the textured finish colors. 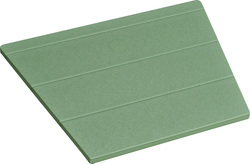 Rectangle end table is shown here between two gliders. Choose colors that coordinate or accent to fit your décor. $220 directly shipped to you or $243 if we finish the assembly for you and deliver it within 30 miles of our stores. These white single gliders are joined with an optional gliding settee table; available in all color choices. 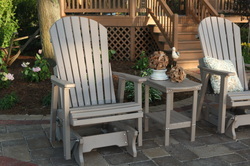 Assembled and delivered with your gliders for an additional $272; or sent in a box with your order for an additional $246, in the smooth finish colors. (add 10% in the natural finish colors). Notice it has 2 holes for ice tea, water bottles, etc., and an umbrella hole for your added convenience. Choose to match or accent the glider colors. Complete set of 2 single gliders and a settee table assembled and delivered in our area $1654 ​(add 10% in the natural finish colors). 38" round conversation table is perfect for swivel rockers, Adirondacks, dining chairs, deck chairs or any seating situation you can image. Shown here in Aruba Blue. Conversation tables are available in all colors. Assembled and delivered within a 30 mile radius of our stores $649 or $587 if you receive it in a box and assemble it yourself (add 10% in the natural finish colors). The choice is yours. Round end tables are so convenient. 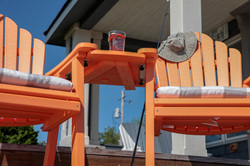 They are available in all three heights and all color choices to match or accent you chairs. Regular height $297, counter height $310, Bar height $325; assembled and delivered in our area (add 10% in the natural finish colors). 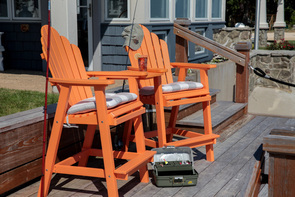 Add a foot stool to your Adirondack in any color. Choose a table to accent your chairs and seating situations. 30" Long x 21" Deep x 18" high. 38" Round Conversation table 38" round x 18" high. Optional neck pillow is $44 in standard Sunbrella fabric and $50-$93 in the premium prints. All color choices are available in all table sizes. 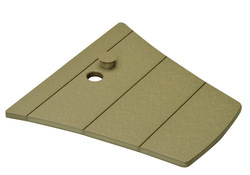 Add a gliding foot stool to your glider in any color. Buffet Table 50" Long x 20" deep x 34" high $859 assembled or $777 in a box (add 10% in the natural finish colors). All color choices are available . 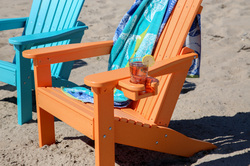 Cupholders are available in all color choices for $45. They are large enough to accommodate an insulated tumbler such as a Tervis (R). 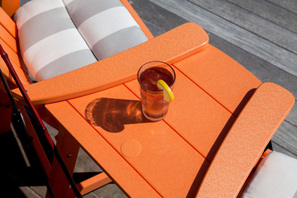 Choose a matching or a contrasting color to your chair. Now they have a notch in them to accommodate your stemware. 18 X 18 Planter $359 (add 10% in the natural finish colors). Dining, counter, bar height chairs Tete-a-Tete $167.